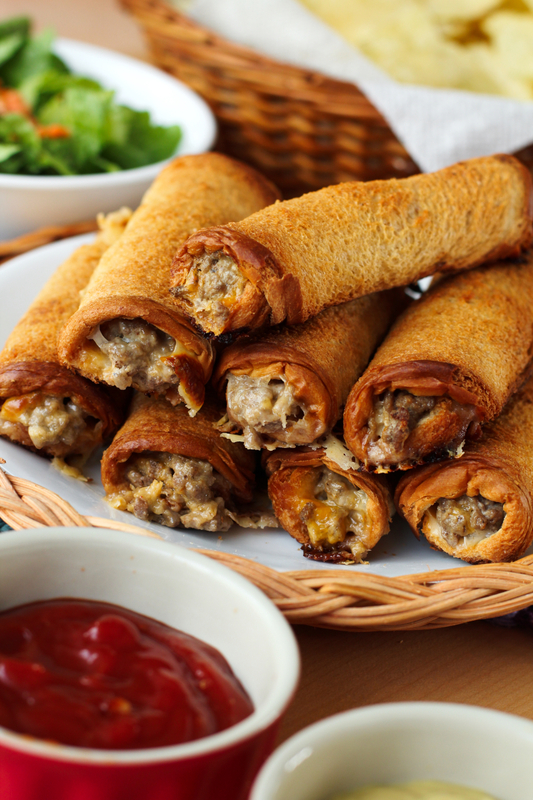 Cheeseburger Roll-Ups put a fun spin on burger night. They will make the whole family happy with their crisp, buttery outside and delicious cheeseburger filling! I love cookbooks. I think it is so fun to look at recipes and to brainstorm new ideas for the blog and what better way to do that than flipping the pages of a cookbook. There's something about an actual book as opposed to surfing the web that I will never tire of. That's why I keep adding to my cookbook collection with no plans to stop! Most of my cookbooks have been given to me, which means I've come across quite a few older books. 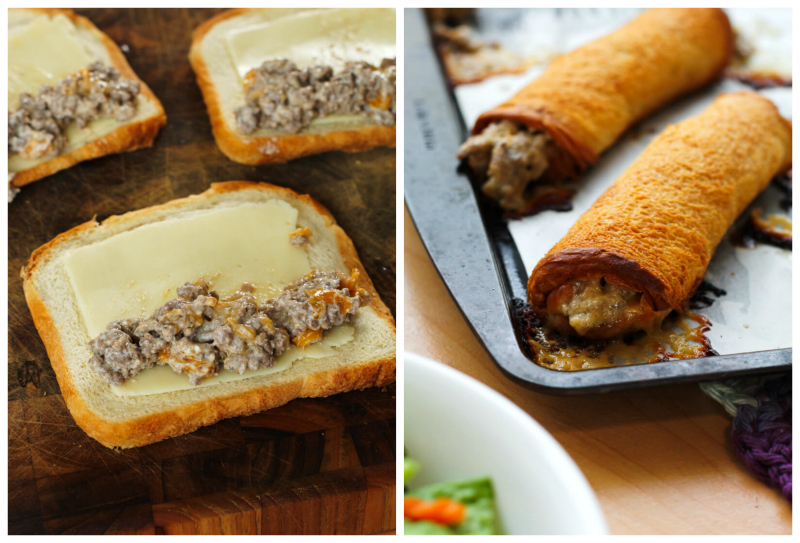 The inspiration for these Cheeseburger Roll-Ups is from one of my hand-me-down books. I actually have no idea where this particular book came from, but it had some great vintage recipes! I adapted this recipe just a bit to suit my tastes and was super happy when it turned out to be a winner! The basics of this one are simple. Ground beef, cheese, and some bread. Good old burger flavors. The ingredients sound a bit boring, I know, but when they are put together in such a fun way (little roll-ups! ), and brushed will yummy melted butter before baking, they turn out unexpectedly light, crisp, and delicious! I recommend serving these with some kind of dip. I serve them with mustard (I went with dijon, but a spicy mustard would be amazing) and ketchup. Totally basic, but totally perfect for this fun finger food. 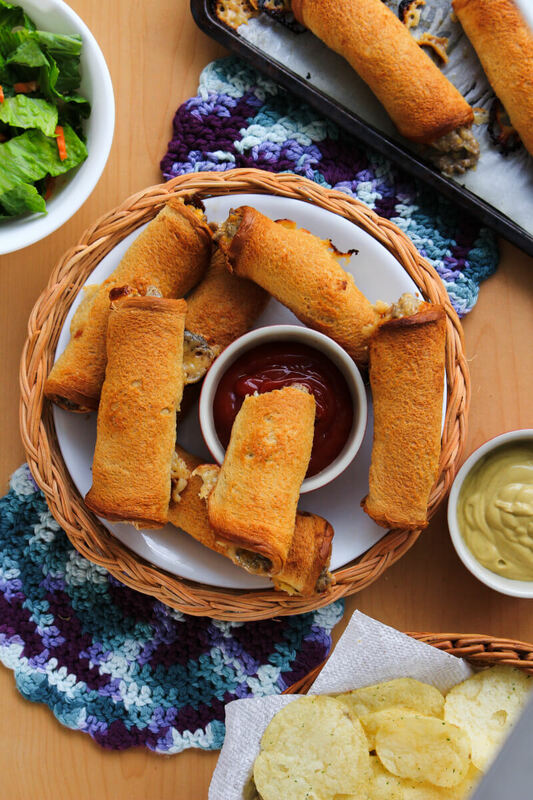 We enjoy these for dinner, but they could easily be made as an appetizer for game day or party! If you try these Cheeseburger Roll-Ups, I'd love to know what you think in the comments below. Enjoy! 2. Brown the ground beef in a large skillet over medium-high heat. Drain off the grease. 3. Stir in the greek yogurt, salt, pepper, garlic powder, and paprika until well mixed. Stir in the cheddar cheese and remove from the heat. 4. Using a rolling pin, roll each slice of bread until it is flat. Place one slice of american cheese on the bread. Spoon the meat onto the bread slices and roll up into log shape. 5. Arrange the roll-ups on a foil-lined baking sheet and brush with the melted butter. Bake for 20 minutes or until golden brown. These are great served with spicy mustard or ketchup for dipping. If baking from frozen, when ready to bake, remove from the freezer and let rest on the counter for 10 minutes. Unwrap the foil and bake following the instructions in step 5. Source: Adapted from Beef Logs found in the What's Cooking in Carroll County cookbook circa 1977. 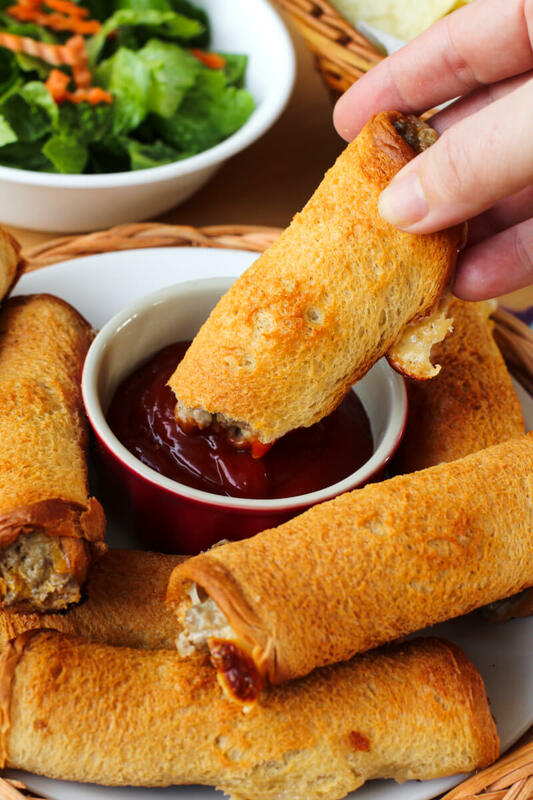 This looks like an interesting take on hamburgers AND rollups. These look amazing! Bet the kids would love um! Especially drizzled with cheesewiz! Cheesewizzzzzz! I like the way you think. Those look fun! I'm odd, I've never really liked burger buns, so this idea sounds perfect. Oh, I think you'd love these! The bread is not bun-like at all. OMG. So creative! My kids would love these! Fun, right?! If you try them, I hope the kids love them! What a fun idea - I bet kids go crazy for these! They're dunkable! The kids love that! Such a cute idea!! These would be great for a football party. Thank you! I think they would be a great choice for game day! I love old cookbooks as well! They have some real gems in them! 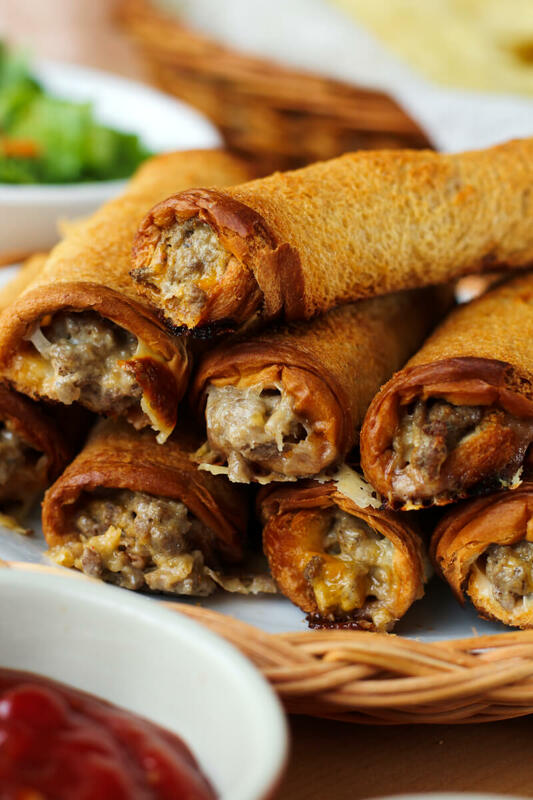 These look fun and I think the name cheeseburger roll-ups sounds much more appetizing than "beef logs", lol! This recipe is superb as you have used bread to make some amazing rolls and baked them too. Such an interesting twist on a cheeseburger. Excited to try this out!